Reading play scripts before seeing the play is the exact same as reading the book before the movie. I had already envisioned how it should be played, the timing and setting all in my head and thus prepared myself to be appalled by any motion not in sync with my vision. My vision was wrong though. 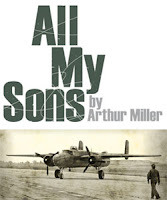 I think that All My Sons is a play that will only work with the right cast, although this production pulled it off marginally. The portrayals of Joe and Kate were flawless and fully deserved their standing ovation, Joe especially simply for making Keller's transformation from family man to the angry, confused and guilt-ridden character that dominates the final act, seem so real and human. Unfortunately, Chris could not pull this off. The actor certainly played it well at the start but as he needed to be more dramatically unhinged; he became fidgety and lost his restraint, perhaps uncomfortable with how he was supposed to attack Joe. I won't go into too much detail about the supportting cast but even though I imagined them differently, they were all good, especially George and Annie, whose chemistry electrified the second act after a slow beginning. The set was authentic though I found the lighting scheme to be a little jokey [George is sad so put him under a blue light, but now he is happy, get him under an orange light!] but it worked although it distracted me a little. But the general lighting was superb, and especially the deep orange flooding the stage as the sun sets. I won't give too much detail about the sets because as long as they are there, they do their job but the set designers did well to give Keller's home a 'Lived In' look with old wood and a seemingly overgrown garden. All the things I found annoying in this adaptation are subjective to every person. For example, some of the things that I would see differently were: Jim's too old to be Chris' s friend, Sue wasn't old enough, and Kate seemed weaker than she was supposed to be. Many seemed too concerned with keeping their accents in check than expressing their emotions. Although it sounds like I thought it was a poor production, that's not true at all, I'm simply nit-picking. I was slightly confused at the start, mainly because the characters were so upbeat and jokey, contrasting so heavily with their true selves, but I soon got it. Like the best suburban dramas, All My Sons shows the gloss and rose-tinted memories that suburbia promises and provides, yet dig a little deeper and the play reveals the dark heart that beats behind the forced smiles and the tragedy that is the American Dream.